"After centuries of peace and prosperity, an unknown force wants to destroy all we have created…" EuropaCorp has debuted the second official trailer for Luc Besson's new sci-fi adaptation, Valerian and the City of a Thousand Planets, or just Valerian for short. This new trailer is much better than the first, with some promising VFX-filled footage and exciting action scenes. Based on the graphic novel series, the movie stars Dane DeHaan as Valerian, and Cara Delevingne as Laureline, special operatives for the government of the human territories charged with maintaining order throughout the universe. They must travel to an intergalactic city full of different species called Alpha on a mission. The full cast includes Clive Owen, Rihanna, Ethan Hawke, Rutger Hauer, Mathieu Kassovitz, Sam Spruell, Kris Wu, Alain Chabat and others. I'm still crazy excited for this, I love seeing Besson go big with space sci-fi. Can't wait. You can still watch the original teaser trailer for Luc Besson's Valerian here, to see more footage from this. 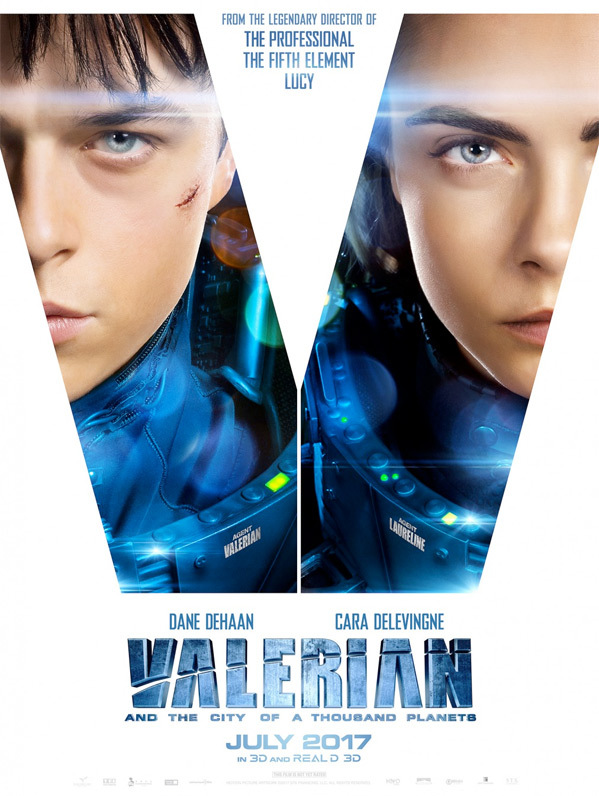 In the 28th century, Valerian (DeHaan) and Laureline (Delevingne) are a team of operatives charged with maintaining order throughout the human territories. Under assignment from the Minister of Defense, the two embark on a mission to the city of Alpha – an ever-expanding metropolis where species from all over the universe have converged over centuries to share knowledge, intelligence and cultures with each other. There is a mystery at the center of Alpha, a dark force which threatens the peaceful existence of the City of a Thousand Planets, and Valerian and Laureline must race to identify the marauding menace and safeguard not just Alpha, but the future of the universe. Valerian is both written and directed by French filmmaker Luc Besson, of La Femme Nikita, Léon, The Fifth Element, Angel-A, Adèle Blanc-Sec, The Lady, and Lucy. Adapted from the graphic novels by Pierre Christin and Jean-Claude Mezieres. EuropaCorp will release Besson's Valerian in theaters starting July 21st in the summer. Follow @lucbesson for more.